Best consumed: With an unaged juniper forward gin Incredibly well balanced, with plenty of citrus, spice, and bitterness to make the perfect gin and tonic. One of our favorites, and an excellent pairing for nearly all gins, but especially classic styles with a heavy juniper head. We’ve reviewed Bradley’s Kina Tonic ([icon name=”star” class=””][icon name=”star” class=””][icon name=”star” class=””][icon name=”star” class=””][icon name=”star-half” class=””]) here before, and well we quite liked it. Like a lot. So naturally, we’re excited about their latest offering, a first as far as we know, a tonic syrup aged in barrels which held Bourbon and after that Big Gin ([icon name=”star” class=””][icon name=”star” class=””][icon name=”star” class=””][icon name=”star” class=””][icon name=”star-half” class=””]). Yes, that is a lot of stars between the two of them. The nose is fresh with a lot of vibrancy. Orange oil, hints of ginger and fresh tree bark. It has a summery, backyard sort of aroma to it. Bright citrus at first, lemon and orange, with a lemongrass/lemon verbena note in the middle. Wood comes through mid-palate, with shades of cedar and cherry. Cinnamon, nutmeg, cloves and even a dash of lavender. The finish is clean, and brisk with the quinine being remarkably subtle. No you can taste it for sure! That’s not what I mean. I mean that the onset of the distinctive tonic syrup finish is so well-integrated into the overall profile of the syrup that it feels like one seamless taste. Tasting side-by-side with the regular Bradley’s Kina Tonic, you can taste the affect of the wood even more clearly. To borrow a metaphor from the world of music production, the wood works a bit like a compressor in music: it doesn’t eliminate character, but it dials the highs and lows back in by just a touch. It feels fatter, tighter, and more polished. Now, I still really like their original syrup, but this barrel-aged one is something special. It mixes a bit more subtle than the main Bradley’s tonic. I suggest staying a little bit south of the high end (4 oz per ¾ oz. serving). Bold flavors, or gins which emphasize a similar flavor profile aren’t your best options here, I think this is an excellent counterpoint to some of your most traditional gins, such as Gordon’s ([icon name=”star” class=””][icon name=”star” class=””][icon name=”star” class=””]). Big Gin also works really nicely with this syrup, so the label is definitely not steering you wrong. Just don’t go around thinking that you should be drinking barrel aged gin with barrel aged tonic syrup. I don’t find that combination working as well, with the notes kind of cancelling each other. Your mileage may vary. Like I said, It’s slightly more subtle, and I think dialing back the ratio of water to spirit and syrup creates a more balanced drink. We think Bradley’s Bourbon Barrel Aged Kina Tonic is best consumed with an unaged juniper forward gin Incredibly well balanced, with plenty of citrus, spice, and bitterness to make the perfect gin and tonic. One of our favorites, and an excellent pairing for nearly all gins, but especially classic styles with a heavy juniper head. 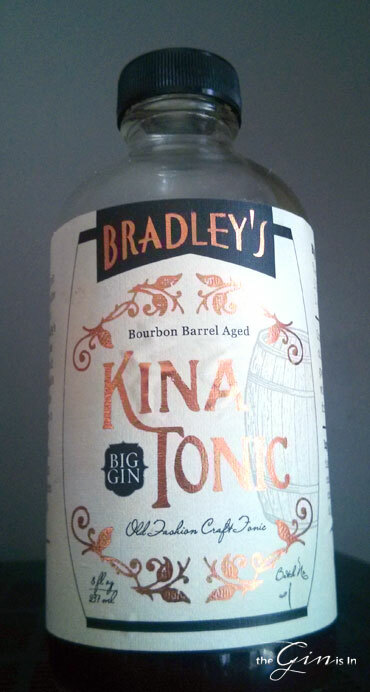 Bradley’s Bourbon Barrel Aged Kina Tonic is available from Amazon for about $16 / 8 oz. bottle.